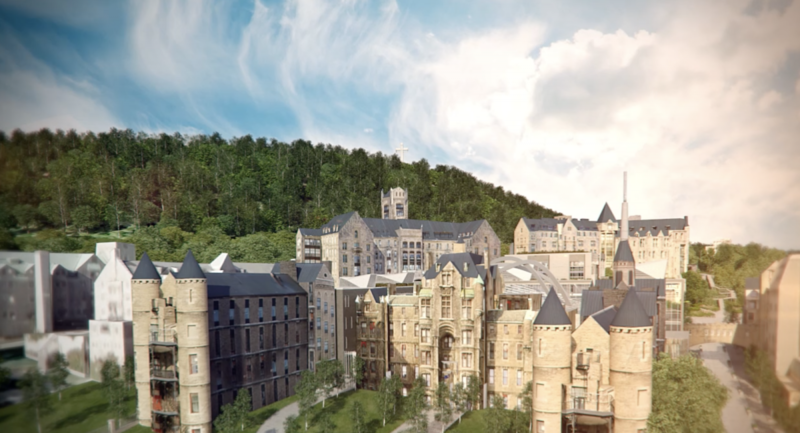 The Government of Quebec is investing $37 million for McGill University to continue its plans to transform the old Royal Victoria Hospital into a global hub for learning, research and innovation in environmental sustainability and public policy. The announcement was made at McGill on Friday, June 22, by three cabinet ministers: Hélène David, Minister responsible for Higher Education; Dr. Gaétan Barrette, Minister of Health and Social Services; and Pierre Arcand, Chair of the Conseil du trésor. The support allows McGill to proceed with detailed design specifications aimed at repurposing the central portion of the 120-year-old hospital into open, high-tech space designed to strengthen multidisciplinary teaching and research, as well as increasing research collaborations with government, private sector and academic partners. These facilities will house McGill’s Sustainability Systems Initiative and the new Max Bell School of Public Policy, while respecting the architectural heritage of the site. A key goal of the proposed project is to enhance Quebec’s standing as a global destination for knowledge creation and talent in high-impact fields shaping our collective future. Many companies in Quebec's vibrant environmental and clean tech cluster are based in Montreal, which also plays host to numerous international NGOs with an interest in supporting the development of forward-looking policy. The new facilities will benefit university researchers across Quebec through McGill’s extensive collaborations. In addition to many joint initiatives with Montreal universities, McGill professors and students partner with regional Quebec universities on sustainability projects. During the planning phase, the Government of Quebec, through the Société québécoise des infrastructures (SQI), will create a master plan for the entire area in collaboration with McGill and the Ville de Montréal. “We will work closely with the SQI to ensure harmony in the development of our plans and approaches over the next couple of years, as this important project moves to fruition,” said Yves Beauchamp, McGill’s Vice-Principal (Administration and Finance). The old hospital has been largely idle since the hospital transferred to the Glen Site in April 2015. Abutting the northern portion of McGill’s downtown campus, the iconic site has played an important role in the lives of thousands of Montrealers for more than a century.